While the definitions vary, you can see that creation and management of any asset used in the development of software is important to ALM. IBM Rational has a broad set of tools supporting the development of software that includes the core capabilities of change management, project management, requirements definition and management, design management, construction & software configuration management, deployment management (software delivery automation) and quality management. By assembling a solution that covers these core capabilities, software development teams can focus on solving complex business problems. For a 5-minute introduction to ALM, watch this video on Jazz.net. For a short introduction to Open Services for Lifecycle Collaboration (OSLC), watch this video on open-services.net . The Jazz platform is strategic for implementing the Rational solution for CLM. The Jazz platform is all about collaboration; it allows individual products to integrate better and more easily, and allows the users of those products who take on distinct roles to work more effectively together than has historically been possible. The Jazz platform supports a more collaborative approach to ALM tools and their users. That approach is open. It leverages the standards used by the Internet. Just as the internet works with data spread around the world, the approach is to allow development team data to be spread around an organization, and yet be as easily accessible as surfing the world-wide-web. Through the support for OSLC , integrations can be provided for both Jazz-based and classic products. Additionally, third party vendors and customers can consume or provide their own OSLC interfaces to support heterogeneous environments made up of Rational, third party, and/or customer solutions. The combination of Jazz and OSLC provides the ability to have unprecedented collaboration, transparency, automation, and traceability. Reduce costs with continuous improvement. In summary, "CLM" expresses the proper scope and differentiated value of our solution. This approach leverages the value that Jazz brings across both IT and systems delivery, delivered via five ALM imperatives. Rational Requirements Composer (RRC): helps teams define and use requirements effectively across the project lifecycle including rich editors for both textual and visual requirements capabilities for lean requirements definition, including the creation of use cases, sketches and storyboards. Rational Team Concert (RTC): integrates change management, source control management, continuous builds (software delivery automation), project planning and reporting/dashboard capabilities. Rational Quality Manager (RQM): provides a shared test management hub for test planning, creation, and execution as well as workflow control, tracking, and end-to-end traceability. Rational Software Architect with Design Management (RSA-DM): enables teams to share, collaborate and manage design information across the application development lifecycle. Rational Reporting for Development Intelligence (RRDI): allows creation and viewing of chart and dashboard style reports. It is an optional install in CLM 2012. When installed and configured it provides users with an additional set of predefined development intelligence reports, as well as the ability to author new reports. Rational Reporting for Development Intelligence is based on the Cognos Business Intelligence (BI) platform. Rational Reporting for Document Generation (RRDG): provides support for generation of document style reports. In CLM 2012, Rational Reporting for Document Generation is included as part of Rational Requirements Composer, Rational Team Concert, and Rational Quality Manager. Authoring functionality for document style reports is provided by a separate purchase of Rational Publishing Engine (RPE). In addition to these applications, the Rational solution for CLM includes a set of process and practices and supporting tool extensions, all packaged in a Rational Method Composer (RMC) configuration. The CLM processes and practices include everything the you need to run the solution. They describe the context and usage model for the products that support the solution -- step-by-step guidance on how to apply the solution, including product guidance in tool mentors. The practices are self-documenting and include Jazz process templates (including Rational Team Concert process and work item templates) for enacting the solution. A published version of the configuration for IBM internal consumption and inline comments can be found here . Customers that have purchased the necessary Rational Method Composer reader licenses can download the configuration from the IBM Rational Solution Process Assets page . Rational Team Concert, Rational Quality Manager and Rational Requirements Composer share a common installer that deploys the shared Jazz Team Server plus the Change and Configuration Management, Quality Management, and Requirements Management applications. The trial licenses that are installed in the Jazz Team Server provide access to the capabilities of these products. This means that you can install any of these products to enable the full set of collaborative lifecycle management capabilities provided by all the products. To learn more about applications, capabilities and product license keys, read the Building products from applications blog post. Though it currently requires a separate installer, Rational Software Architect with Design Management, part of the Rational solution for CLM, can be installed into the shared Jazz Team Server to provide design management capabilities. Any of the CLM products can be used individually or combined as an organization's first step towards fully leveraging the power of Collaborative Lifecycle Management. With each tool adopted, the organization will see continual improvements in quality and efficiency. The CLM product components are built on top of Jazz Team Server, which provides the foundational services that enable a group of tools to work together as a single logical server. The figure below shows a typical departmental installation topology using the current product versions. Each application shares an associated version of Jazz Team Server. The deployment can leverage a single database server to host the individual database instances. This helps to reduce administrative costs including simplifying backup procedures, although is not required. The diagram below shows the various product components or applications. These applications represent capabilities and do not map 1:1 to the products. For example, Rational Quality Manager contains capabilities that are found in each of the applications (CCM, RM, QM, DM and JTS) shown below. A Rational Quality Manager Quality Professional license has access to defining textual requirements in the RM application, work items and plans in the CCM application, and all capacities in the QM application and Jazz Team Server. Although the Rational solution for CLM supports a very wide variety of deployment topologies and supporting operating systems and software, start from a selected set of the most tested and understood combinations. These standard topologies can be found in the Deployment planning and design section of this wiki. A catalog of products that support the Jazz initiative. Collaborative Application Lifecycle Management Scenarios – the scenarios work from the outside-in by providing real-world, role and task based user experiences that explore end-user goals and their needs to access data throughout the lifecycle. They are designed to validate the Jazz Integration Architecture, Jazz Foundation, and OSLC specifications. OSLC – to unlock the information buried within development tools, open and agreed upon interfaces are needed that allow different tools to share and exchange the data that they produce. By creating specifications that define common shapes, uses, and relations between software lifecycle data, the OSLC community helps us eliminate traditional barriers between tools and to open the door to new forms of collaboration. OSLC specifications are based on Internet standards, including a novel use of Linked Data not only for reading, but also for creating and updating. OSLC’s use of linked data to enable protocol-based integrations of software tools is often referred to as “linked lifecycle data”. Jazz Integration Architecture (JIA) – a set of inter-connected technologies and specifications, consisting of reference architecture, API specifications, a set of common services and tool building blocks. At the center of JIA is the Jazz Foundation Services, which provides services to enable groups of tools to work together. Powering much of JIA are standard RESTful APIs and standard resource definitions, which enable participating tools to easily share data. Jazz Foundation – an implementation of the Jazz Foundation Services, and optional toolkits to aid in the construction of Jazz applications. The Jazz Architecture is an open architecture for lifecycle tool integration that supports a range of integration patterns, embracing linked lifecycle data (OSLC) for sharing lifecycle resources, and defines Jazz Integration Services for common capabilities like administration, reporting, dashboards, etc. Allows new and improved forms of integration to be added to the mix as they are developed. Open Services for Lifecycle Collaboration is an open community of developers and organizations who collaborate across many software lifecycle domains to help standardize how software lifecycle tools share data. Ensures the architecture is open to new lifecycle tools, where any lifecycle tool written by a vendor, an open source project, or in-house development, can consume or provide the OSLC protocols. This enables customers to integrate lifecycle tools they already use. For CLM, there are four important domains that must be integrated, and four important OSLC specifications that define how: Change Management, Design Management, Requirements Management, and Quality Management. This classification of key concepts of ALM simplifies the integration points, not only between the CLM components, but also for third-party, open source, or in-house tools. Any product can act as a provider, a consumer, or both, of linked lifecycle data, and integrate with any other tool that does the same. This open and flexible approach is how the integration of each customer’s unique set of software lifecycle tools is made a practical reality. The products covered in this architecture brief implement OSLC specifications; as such, they are either a provider or a consumer of linked lifecycle data. The key specifications are: change management, requirements management, and quality management. Open Services for Lifecycle Collaboration provides open, public descriptions of resources and formats for sharing artifacts across the software lifecycle. The term artifact is commonly used to describe the content the users interact with. In the programmable web, this is called a resource. The strategy treats all development artifacts as resources at the end of the URI, where both XML and JSON are supported formats. RESTful interfaces are used to GET, PUT, POST or DELETE data in each of the repositories. Each tool implements the OSLC specification for their domain (for example, change management, requirements management, quality management). In addition, tools that integrate the Jazz Foundation provide the additional benefit of a common UI framework, link-types describing cross-discipline relationships, rich hovers, queries, dashboards that host cross-repository widgets, and much more. For example, when a requirements user chooses to link to, or create an artifact in Rational Team Concert, Rational Requirements Composer uses the Rational Team Concert change management RESTful interface to send the data defined by the public OSLC change management specification . Per the specification, Rational Requirements Composer delegates the user interface to Rational Team Concert, meaning, the details and semantics provided by Rational Team Concert are consumed by and displayed in a Rational Requirements Composer dialog. When the user clicks OK, Rational Requirements Composer sends a PUT request to the Rational Team Concert change management service. Links are created between both artifacts using link support provided by the Jazz Foundation. This same strategy is employed when a tester in Rational Quality Manager chooses to link to a work item in Rational Team Concert; Rational Quality Manager calls the change management service using the OSLC specification. This provides a powerful and resilient integration which supports independent evolution of the products. The URL integrating the two tools can stay the same with each new upgrade, and changes can be made to the user interface (coming from the provider application) without compromising the consumer’s integration. The delegating UI is helpful to the end user but it is even more helpful to a developer. Without delegating the UI the product developers would have to have in-depth knowledge about how to create a particular artifact. For example, creating a defect would require knowing which of the attributes are required and this would require knowledge about the used process and so on. This would increase the coupling between the products and increased coupling has a negative impact on independent evolution. This demonstrates two important architectural decisions to delegate complex capabilities to the provider and provide a simple way to discover a resource. Delegating the UI results in a coarse grained coupling only, and it keeps the barrier of entry low for existing products. The above diagram illustrates the associations between the core assets of the Rational solution for CLM. The intra-product relationships (the relationships that exist within a lifecycle application) are represented by a dashed line, and the inter-application relationships (the relationships that exist across applications) are represented by a solid line. Those in blue were added in the CLM 2011 release. A few examples of these relationships are listed here. However, the reader should study the diagram to understand all of the relationships that exist. An example of an intra-application relationship in the Requirements Management application (RRC) is that of a Requirement to a Collection of requirements. A requirement may be of many types, such as, declarative, use-case, storyboard, UI sketch, etc. A collection is a logical grouping of these requirements. Therefore, an analyst may choose to “bundle” a collection of requirements that apply to a specific release, or possibly group requirements that affect a specific bug-fix, allowing the team to know exactly what is to be implemented. Another example is the relationship between a Test Plan and Test Cases in the Quality Management application (RQM). Test Plans define the overall plan for a testing effort, and they generally include a number of Test Cases that perform the various tests against the application. Similarly, Test Cases are related to Test Executions, which in-turn generate (and hence are related to) Test Results. Lastly, the Change and Configuration Management application (RTC) also has a number of intra-application relationships. For example, when doing iterative development it is important to have a high-level Plan for a release (such as Version 1.0) and several iteration Plans (Sprint 1, Sprint 2, etc. ), that identify the work to be done in each iteration, and will be executed against the Release Plan, thus the Plan relationship to itself in the diagram. 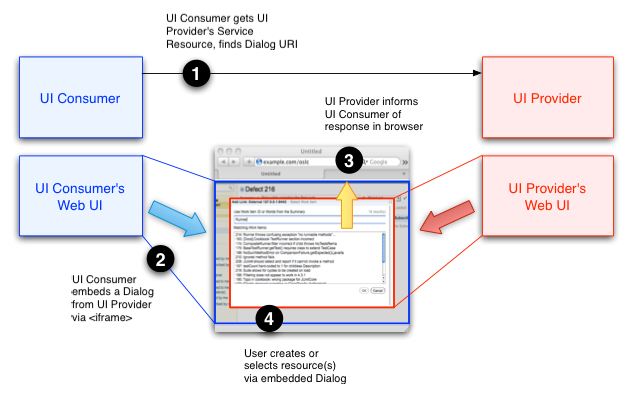 The inter-application relationships shown by the solid lines illustrate the relationships between the applications. These relationships provide for the Collaborative Lifecycle Management integrations. An example of this is the relationship between a Requirements Collection in RM and a Release Plan in CCM. The Requirements Collection defines the requirements to be implemented in the release, and the Release Plan indicates the work that needs to be done in order to implement the appropriate requirements. In this instance, the Requirements Collection is said to be “implemented by” the Release Plan, and the Release Plan “implements” the Requirements Collection. Similarly, the Requirements Collection may be linked to a Test Plan in QM, which allows the quality team to ensure they are testing the appropriate requirements. In this instance, the Requirements Collection is said to be “validated by” the Test Plan and the Test Plan “validates” the Requirements Collection. To complete the traceability, Release Plans in CCM may be linked to Test Plans in QM, such that RQM “tests” the work being performed per the Release Plan. The Jazz Architecture has enabled a diverse ecosystem of third party tools to emerge based on the available interfaces. The Jazz Integrations Dashboard provides a list of all those IBM Business Partners and other vendors providing value added integrations to the Rational solution for CLM. Further, the internal, Jazz Integration Management Dashboard describes the work by the Gearbox team to develop additional integrations. Lastly, the IBM Rational Integration Engineering Team has developed a number of salable commercial assets (integrations, extensions, utilities, etc.) that are available to use with customers. Common technology and server platform: The Rational solution for CLM constitutes products that are based on a common technology platform called Jazz. The CLM products all run on top of a Jazz Team Server and use Jazz Foundation Services. This provides the products with a basis for deploying, managing, and integrating separate deployments of products based on Jazz in a common way. Open Services for Lifecycle Collaboration framework: The Jazz Team Server that the core CLM products run on implement OSLC as a means for integrating and communicating with each other. This provides a common way for sharing, integrating, and tracing assets across the products that would otherwise not be possible. For example, work item queries in Rational Team Concert can be hosted on a dashboard in Rational Quality Manager. This is also true of products that are not Jazz based but implement the OSLC specification. For example, Rational ClearQuest (v7.1.0.2 and newer) implements the OSLC 2.0 Change Management specification allowing it to share and integrate change management data bi-directionally with other tools that also support this specification, like Rational Team Concert. IBM has committed to providing and improving product integrations between the Jazz based CLM products and the broader portfolio of products. Additionally, many IBM Business Partners and market leading software products are supporting OSLC to increase their product interoperability with these offerings and the industry as a whole. Token licensing support: The Rational solution for CLM supports a token licensing model enabling customers to flexibly use whichever token supported product in Rational they need at any given point in time. Tokens are a layer of abstraction above products allowing customers to flexibly shift their investment from one product or domain to another without having to make product by product license purchases that are mutually exclusive. Open commercial development: The Rational solution for CLM is developed by IBM employees fully committed to making a highly innovative offering. However, the Rational solution for CLM is developed openly in the community on Jazz.net. Customers can see the ongoing work and plans, status, enhancements, and defects from IBM as well as those submitted by others. Additionally, builds of the milestone, beta, and release candidate versions of the products are incrementally provided for anyone registered (free) to try out. The source code for these products is also available on Jazz.net as well as incubator/prototype offerings being explored. Unlike an open source project, the software that goes into the releases is solely developed by IBM and is subject to strict quality assurance and management. Broad and deep lifecycle management solution portfolio: The Rational solution for CLM has a broad scope covering all major lifecycle management activities and also is deep providing best in class support for domain/role specific activities in the software development lifecycle. This is supported, integrated, and provided completely from IBM Rational reducing the overhead in managing and supporting the solution while assuring greater overall quality and reducing the investment risk in the solution. Scalability and globally distributed development support: The Rational solution for CLM has been optimized to scale and support hundreds and even thousands of users. Additionally, it uses http/https as its communication protocol and has been optimized for usage over wide area networks enabling it to support distributed users and groups from multiple locations while preserving the intended user experience. Rich web 2.0 user experience: The Rational solution for CLM provides a rich web client experience with features such as drag and drop, rich hovers, etc. The web client is considered a first class client that enables customers to flexibly access and use the product without having to worry about installing software or compatibility. It supports industry leading browsers including Microsoft Internet Explorer and Mozilla Firefox. Broad platform support: The Rational solution for CLM has the broadest platform support in the industry today as described in the system requirements. Enterprise class entitlements included with paid licenses: Customers are entitled to use WebSphere Application Server, DB2, and Cognos for their CLM deployments. Cognos adds development intelligence style reporting to the Rational solution for CLM. Jazz enables the Rational solution for CLM to be open and complement an existing customers software stack, both Rational and non Rational offerings via OSLC. It should be noted that the products identified in the "IBM Product Alternatives" section can also be considered complementary if a customer already owns these products or requires them. All of these "Product Alternatives" include one or more integrations to the Rational solution for CLM. However, there are notable Rational products that directly complement the core Rational solution for CLM with minimal to no overlap as identified here. A customer-facing Extend your tools page has been created that details all the integrations to Jazz and the Rational solution for CLM. There include native IBM supported integrations planned to non-IBM based products including HP Quality Center, Atlassian Jira, and open source Git. Rational Method Composer - IBM Rational Method Composer is solution for managing, tailoring, and communicating process descriptions. RMC consists of two components, (1) Process Assets in the form of the IBM Practice Library and the Rational Unified Process Library and (2) a tool to author, tailor, configure, and publish process descriptions. RMC process descriptions provide the human readable guidance team members need to work together effectively and efficiently as a team. RTC process templates provide the machine readable rules that configure the tool to support your process. Together, RMC and RTC provide a powerful solution for process management, process enactment, and measured capability improvement. The Rational solution for CLM includes practices and processes in RMC, which require an RMC reader license to access; to tailor those, a full license for RMC is required. Rational Application Developer - A highly enhanced eclipse IDE that helps Java™ developers rapidly design, develop, assemble, test, profile and deploy high quality Java/Java EE ™, Portal, Web/Web 2.0, OSGi, Web services and SOA applications. Rational Team Concert directly integrates into a RAD IDE and also provides specific integrations for collaborating on unit testing and profiling of applications. Rational Software Architect - A family of products that provides integrated design and development support for model-driven development with the UML. Rational Software Architect provides extensions for a variety of problem and industry domains, such as deployment planning, SOA or communication applications, RSA-DM, included in the Rational solution for CLM, is one of the product editions included in the RSA family. Rational Asset Manager - IBM Rational Asset Manager (RAM) offers a definitive, standards based library to help organizations manage, collaborate, and govern the business and technical assets involved in software and systems delivery. Rational Asset Manager directly integrates with Rational Team Concert for the storing and versioning of software assets in the RAM library. Rational Functional Tester - a testing tool with automated testing capabilities for functional testing, regression testing, GUI testing and data-driven testing. Rational Quality Manager can manage and automate the execution of automated tests developed with Rational Functional Tester. Rational Performance Tester - a performance testing tool for load and stress testing with automated performance testing capabilities to validate the scalability of web and server based applications. Rational Quality Manager can manage and automate the execution of automated tests developed with Rational Performance Tester. Rational Publishing Engine - automate the generation of documents for ad-hoc use, formal reviews, contractual obligations, or regulatory compliance can help improve productivity and reduce risk and cost. Rational Insight - delivers measurement best practices to help organizations reduce time to market, improve quality, and take greater control of software and systems development and delivery. It provides objective dashboards and measures for transparency and control into risks, status, and trends. Rational ClearCase - provides sophisticated version control, workspace management, parallel development support and build auditing to improve productivity. Rational ClearQuest - provides change tracking, process automation, reporting and lifecycle traceability for better visibility and control of the software development lifecycle. Rational DOORS - reduce costs, increase efficiency and improve quality by enabling you to optimize requirements communication, collaboration and verification — throughout your organization and across your supply chain. Rational RequisitePro - helps project teams to manage their requirements, to write good use cases, to improve traceability, to strengthen collaboration, to reduce project rework, and to increase quality. Rational Build Forge - an adaptive process execution framework that automates, orchestrates, manages, and tracks all the processes between each handoff within the assembly line of software development, creating an automated software factory. Rational AppScan - enables organizations to take a strategic approach for addressing Web application security. IBM Tivoli Service Request Manager, Tivoli Application Dependency Manager, and Tivoli Provisioning Manager – Both Rational Team Concert and Rational Quality Manager integrate with Tivoli Service Request Manager to provide Development-Operations collaboration and coordination. Rational Quality Manager further integrates with Tivoli Application Dependency Manager and Tivoli Provisioning Manager to provide test lab integration with technology operations management. Lotus Connections – Rational Team Concert integrates with Lotus Connections to improve and enable business and development collaboration and social networking. Rational Quality Manager Integrations . Related topics: Deployment planning: Where to start?